Twice each month, I invite personal finance bloggers to share their stories as part of the Beginner to Blogger interview series. Today, I’m excited to have Marc of Vital Dollar here to share his experience. While many of the bloggers who participate in the interview series are early in their blogging journey, Marc is an experienced vet when it comes to blogging – he’s been a full-time marketer since 2008! If you’ve ever dreamed of becoming self-employed or selling a website for six figures, you’ll love this interview. Take it away, Marc! My name is Marc and my blog is VitalDollar.com. I write about topics related to managing money, saving money, and ways to make more money. I’ve been working online full-time since 2008, but just launched Vital Dollar earlier this year. On a personal note, I live in Pennsylvania with my wife and our two kids. Both my wife and I were raised to take care of our money. We both grew up in families where money was tight, but our needs were always met. When I was growing up my parents used the cash envelope system, and they always made their money stretch as far as possible. I don’t think there was a specific moment or situation that led me to focus on my own finances, it was just the way my parents raised me. From my adult years, I think my introduction to full-time jobs was a bit of a wake-up call. My first few years out of college I struggled to find a decent job that I liked. I had a few different jobs, but I was never happy in any of them and I wasn’t making very much money. I quickly learned that I didn’t want to do this for another 40-45 years. While those years were frustrating, they helped to push and motivate me to start my own business. My 20’s were kind of a waste financially. Even though I managed my money pretty well, I just wasn’t making much. I wasn’t in debt, but my dreams of early retirement weren’t looking so good. But fortunately, my 30’s (I’m 39 now) have been much better. I think my biggest mistake was just not making enough money. What really turned things around was starting a side hustle (web design and blogging) that eventually became a full-time income. Looking back I wish I would have started a side hustle earlier instead of just trying to find the right job. When I was 28, I started blogging consistently while I was trying to use a blog to attract web design clients. The blog took off really quickly, and I was able to quit my full-time job the same week I turned 30 years old. I’ve been self-employed for almost 10 years now, and it’s completely changed our family’s financial situation. Can I give two? First, I’d say struggling to find the balance of living frugally and still enjoying life with a young family (my daughter is 5 and son is 3). We try to cut expenses where possible, but I also don’t want to look back and regret being too cheap to enjoy life while our kids are growing up. Finding that balance is a bit of a struggle at times. Second, I wish I had more time to educate myself on a wide variety of investments. I stay busy with my work and my family, and there are always things I want to study and research that take me a long time to get around to. To me, it means being in a position where I don’t have to worry about money, and I can live a lifestyle that I want. Going by the 4% rule, my wife and I could be classified as financially independent now, but we’re definitely not at a place yet where I feel freedom. We’re a little over halfway to the number that we have as our target for considering ourselves to be financially independent. With two young kids, I’m sure our expenses are going to increase, especially if we’re going to be paying for a good part of their college education (if they go to college). We also live on a property that requires a lot of time and money in upkeep, and I’d like to be able to start paying other people to do more of that so I can free up more of my time. My wife and I also want to be able to travel a lot in our retirement, so for those reasons, we still have quite a way to go financially. Other than my career, I don’t think that much has changed. Hobbies and activities haven’t really changed, and relationships definitely haven’t changed. One big change was two years ago when we moved to a new house. My wife and I wanted more privacy than we had at our old house, and we wouldn’t have been able to afford a larger property if I was still in my old career. We were able to upgrade our house and still pay for it in cash, so not having a mortgage is one of the biggest perks of our move towards prioritizing our finances. My biggest piece of advice would be to start saving for retirement now. If you look at a chart that shows the power of compounding interest, it’s easy to see just how valuable the early years are. I would advise contributing as much as possible to a 401(k) and Roth IRA. My second piece of advice would be to find a job that you love and one that challenges you. I tried several different jobs and didn’t really find what I wanted, so I started my own business on the side. Most people I know don’t find their dream job right out of college. I have a few friends who bounced around a few times and after several years they found the job that was the right fit for them. Don’t get discouraged if your first job is disappointing. 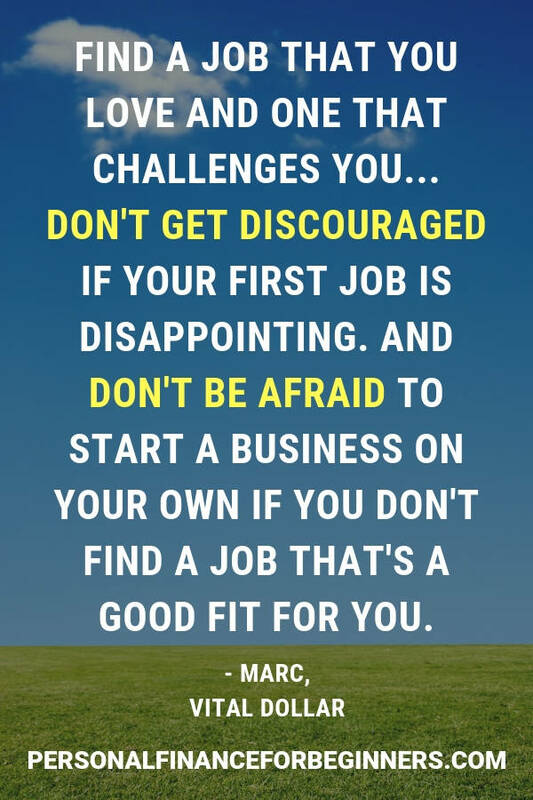 And don’t be afraid to start a business on your own if you don’t find a job that’s a good fit for you. Don’t use other people you know as your financial benchmark. Most people are in bad shape financially, so don’t compare yourself to them. If you want to reach financial independence, you need to be much better with money than 90% of the people out there. It seems like a lot of people in our society justify debt because everyone else has it too. My advice is to establish your own financial goals and realize that reaching those goals will probably require you to make different decisions than some of your friends (like not taking on a monthly payment for the latest smartphone). The biggest decisions have involved selling online businesses. Although I’ve been self-employed for 10 years now, I’ve worked on a number of different websites and projects, and I’ve sold some of them when I’m ready to move on. In 2016, I sold one of my sites (actually it was a couple of sites that I sold together) for $500,000. Last year my wife and I sold a business that we had been working on together for $225,000. We had been selling private label products on Amazon for about 2 years and we decided to sell the business because it wasn’t what we wanted to do long-term. This year I sold a blog for $216,00 ($194,000 after broker fees). Selling websites and online businesses can bring in a nice lump sum of money, and those three sales have had the biggest impact for us in the past 3 years. Of course, when you sell a website or business you lose the ongoing income, so it’s not all positive. But if you can replace the income, you’re in good shape. My wife and I choose to prioritize our house. I know it’s a big expense compared to saying that I like to splurge on a new pair of shoes or something like that. We waited several years to buy our current home because we wanted to get our retirement savings in order, and we wanted to be able to afford the house with no mortgage. We definitely could get by with a house/property that costs considerably less money, but we felt like it was a great place for our family. Coincidentally, since we moved here two years ago we’ve become a lot more focused on reaching financial independence, and while we love where we live, I’m not 100% sure we would make the same decision again. I actually read very few books. I read a lot of articles online, but not many books. One book I did read that I thought was pretty good was Dave Ramsey’s Total Money Makeover. I’m not a huge Dave Ramsey fan (although I don’t dislike him either), but I thought the book was good because it presents a very simple plan. There’s nothing complicated or confusing about it, although it does require discipline. For anyone who is coming out of college with student loan debt or someone who is just starting to take their finances seriously, I think it is worth reading. I started my first blog back in 2007 because I wanted to find some clients who would hire me to design their website. The blogging approach worked pretty well, but I quickly realized that I liked blogging more than I liked working for clients. So after a few months, my focus shifted to growing the blog and I only did a small amount of client work. 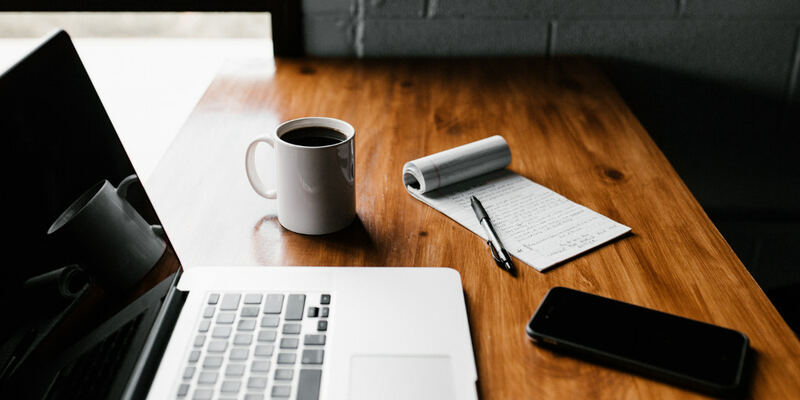 With my current blog, Vital Dollar, I started the site because I wanted to be able to write about the things I’ve learned over the years related to managing money and making money. I also wanted to learn more about finance, and I’ve always found that having an active blog is a great way to learn about something. As an active blogger you’ll immerse yourself in the topic, so you’re bound to improve your own knowledge in the process. I guess if I could only keep one post it would probably be my list of 125+ ways to make money in your spare time. That’s one of the more popular posts on the site and I think it’s really useful. I know so many people want to make more money but don’t know where to start. My own side hustle turned into a full-time business and totally changed my family’s financial situation, so I know the power of a side hustle. I also plan to update that post at least once a year to keep it fresh and relevant. Aaron, thanks for the opportunity! You have a great blog and it’s a pleasure to be able to get involved.